This is what my design wall looks like these days - I love how bright and colorful and full of different blocks it is. I'm simultaneously working on 3 different quilts, plus that lonely teapot block really needs to be finally used in some project. I've never worked on so many quilts at once before and I'm enjoying it a lot. The string quilt is based on the one named Valentine from The Practical Guide to Patchwork by Elizabeth Hartman. I decided to use more colors and make my quilt a little smaller than what the instructions call for, so I needed to draw my own layout. I need to make 30 blocks, I have 9 so far, clearly I have a long way to go. My second quilt is based on this beauty Rita made a while ago. I'm planning on this being our picnic blanket but I might change my mind. A lot depends on how soon I'll get sick of making an insane amount of HSTs. The other day I was trying to replicate the wonderful bedding Denyse Schmidt designs and this block is what I came up with. I actually made another similar block which I turned into a pillow case over the weekend, so the same fate might await this lonely block. I thought these colors would work great for a quilt in our bedroom but I'm just not sure anymore. So, that's what I've been working on lately. How about you? Beautiful projects! The colors are amazing! I can't wait to see your finished string quilt! Oh so nice new projects. I like the string quilt best but the others are gorgeous, too! love those string blocks! All those little hst's - it will be a stunning quilt, for sure. Your DS inspired block is wonderful - I can definitely see it in my bedroom! Ooh, LOVE the string blocks. So happy and cheerful. I've had my sketch book/graph paper out a lot lately too! I love the way all those projects look together...gorgeous!! Oh my gosh!! Love your design wall!! Your HST WIP is speaking to me. I'm trying to resist the siren call. Tell me more of getting sick of the HST? LOL. I love all your colorful WIPs, but I especially love the grey quilt on the bed in your header. 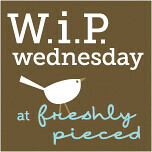 I just came over from the Freshly Pieced WIP page, so it's my first time seeing your blog, it's lovely! Now I shall have to hunt down the post on that quilt! loving that hst wip. so pretty. everything is so colorful! I love all three of your quilt starts. Thanks for sharing. I really like that HST quilt you started. The string quilt is amazing! I love it! Ooh, I love everything on that wall! I really want a better look at the teapot. I like it a lot! Did you come up with that design? Is my china cabinet showing again? I love that HST quilt of Rita's - I very nearly decided to have my bee-members make me some HST blocks but went in a different direction at the last minute. Mainly because I detest making HSTs even though I love how they look! All your projects look wonderful. Wow - your string quilt is looking really stunning. I love how you've used black as the centre string. And after seeing your picnic rug I think I need to make one of those - so gorgeous! They all look so great. And colourful! I've loved that one of Rita's for a long time. Cant wait to see how yours turns out. Could you please tell me what fabrics you've used for the green and blue in that last fabulous block. oh everything on your wall looks great! I love working on several projects at once! Love what's on your design wall, such a beautiful first of colour. Everything is looking just beautiful!